SINGAPORE - With DBS taking a huge provision for its oil-and-gas (O&G) exposure in the third quarter, there is increasing chance that the worst could be over for the lenders from O&G pain. But analysts are also expecting things to stay uninspiring as the fundamentals for the oil sector have not dramatically improved either. The ace in hand is now the higher loan growth that may flow through the second half of the year, and into 2018. The dull prognosis came as DBS closed off the earnings season on Monday with an underwhelming third-quarter result. Net profit for the three months ended Sept 30, 2017, fell 25 per cent to S$802 million, as the bank almost doubled its specific provisions for bad debts. Speaking to reporters, DBS CEO Piyush Gupta acknowledged that the oil industry, especially that of deep water exploration, will remain challenged by developments in renewable energy. One analyst said, viewed this way, DBS might have been underestimating the oil industry's structural pain, with Mr Gupta himself now expecting consolidation in the industry. DBS raised its specific allowances for credit and other losses to S$815 million for the third quarter, 87 per cent higher than a year ago. Mr Gupta added that the bank continues to be conservative on the estimated collateral values taken for the oil-and-gas players. "I can say with high confidence that we've cleaned the book. We're highly unlikely to take more in the book," he said, referring to O&G provisions. Analysts also noted that DBS and OCBC said no new names have been added, while UOB told analysts that just one more big oil-and-gas account would be classified as a bad debt in the fourth quarter. Fitch Ratings analyst Ng Wee Siang said: "I believe the majority of the large troubled accounts would be classified by the industry by year-end. They are existing names, and this means the issue has deepened but not broadened. With oil prices stabilising as well, I believe the worst is over." Shares of the three banks traded lower on Monday. DBS closed at S$22.79, down 18 Singapore cents. OCBC fell to S$11.72, down nine Singapore cents, and UOB dropped one Singapore cent to S$24.76. A Nomura report spelled out the frustrations still confronting the O&G segment: charter rates are depressed; contracts remain relatively shorter-term and so signal uncertainty; offshore support vessels are still in a state of oversupply; and capital expenditure of oil majors should increase, but cautiously. Ivan Tan, director of financial services ratings at Standard & Poor's, said the worst may not be over as these fundamental factors continue to persist. "But as banks continue to make additional provisions, their downside risks become more limited," he told The Business Times. Specific allowances for OCBC loans for the quarter were 40 per cent higher from a year ago at S$138 million. This was driven by a number of restructured accounts which, though continuing to service their repayment obligations, exhibited ongoing weakness and declining collateral valuations, OCBC said. OCBC's chief Samuel Tsien noted that there had been no noticeable uptick in chartering rates, and no new capital coming in. Over at UOB, specific allowances at UOB on loans and other assets for the quarter decreased by S$51 million to S$247 million compared with a year ago. The amount of non-performing loans (NPL), however, grew 7 per cent, with the new formation of NPL mainly driven by a large account in the O&G sector, which remained under stress, UOB said. DBS thinks its NPL has peaked. And in kicking off the banks' results season for the third quarter, OCBC's Mr Tsien noted that there has been increasing charters contracts and drilling activities. In a similar vein, a PhilipCapital report noted that there have been improvements in the utilisation rate at the beginning of the year, and more rigs have been put to work. "We believe the green shoots of recovery in the industry would limit further deterioration of the offshore oil and gas assets," it added. OCBC's 12 per cent increase in net profit for the third quarter to S$1.06 billion was driven by stronger asset growth and higher net interest margin. Net interest income grew 12 per cent to S$1.38 billion, riding off an 11 per cent increase in loans. OCBC's wealth management fee income also rose 32 per from a year ago, partly contributed by the former wealth and investment management business of Barclays in Singapore and Hong Kong. UOB registered a 12 per cent rise in its net profit to S$883 million, driven by broad-based growth. Net interest income increased 15 per cent to S$1.41 billion, with net interest margin cruising to 1.79 per cent from 1.69 per cent. Nomura's analyst also noted in a report that UOB's US-dollar loan book fattened by 12 per cent from a year ago, which is believed to be a result of increased trade activity. 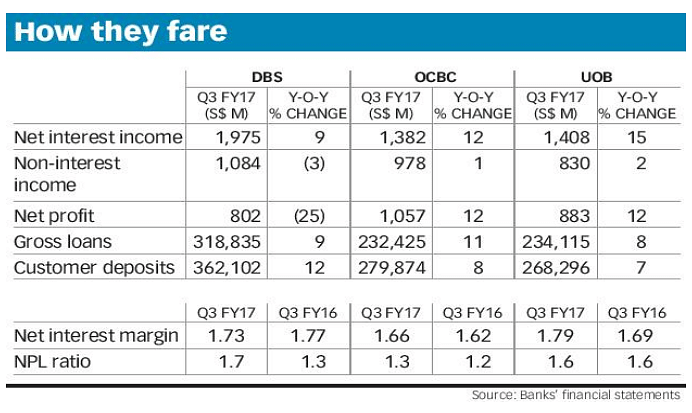 Over at DBS, net interest income rose 9 per from a year ago to S$1.98 billion, while net fee and commission income was up 12 per cent to S$685 million. OCBC and DBS are now guiding for 7-8 per cent loan growth for the full year. There was no specific loan growth target from UOB, which did not hold a media briefing. But in a media statement, UOB's chief Wee Ee Cheong said the bank "believes in Asia's long-term prospects".